You are here: Home / Investments / Mutual Funds: Growth / Dividend / Dividend Reinvestment, Which one should you, choose? Are you thinking of investing in mutual funds? Have you finalized a fund based on past performance? Great! But which option will you choose; Growth, Dividend or Dividend Reinvestment? If you have decided to invest in a Mutual Fund, firstly let me congratulate you for your investment decision. If you want to but don’t know how to invest in a Mutual Fund, check this to understand it better. But merely deciding to ‘invest’ is not the end of your investment story. In fact it is the start of a love affair that will throw up questions at every step before you can settle in. Firstly, the fund that you choose will play an important role in terms of whether or not it fulfils your investment requirements. Once you zeroed in on your Fund, you will have to decide which method or option you will choose. Mutual Funds come with 3 investment options: Growth Option, Dividend Option and Dividend Reinvestment option. Which one should you choose? Dividend option also known as Dividend Payout option is something which will make certain payments at periodic intervals depending on the fund’s performance. It is often chosen by people thinking it will give them periodic income from their mutual fund investment. This payout is however not guaranteed, as if the markets do not perform well; the dividend may be lower than the previous year or nothing at all. So keep this in mind. The other factor is once the dividend is declared the NAV of your fund will go down by that much. For instance if the NAV of a fund ‘A’, you invest in is 100, and it declares a dividend of 20% that is 20, the NAV will go down by that much and your new NAV will be 80. Dividend payout option works in such a way that it will hand out to the investor, whatever performance based appreciation or profit the fund makes. In other words your invested money is returned to you from time to time. Hence the NAV keeps reducing by that much, since you have received that much share of your investment. Other factor is TAX. Dividend is TAX FREE. Well it is, at least in your hands. Dividend arising from an Equity Fund is Tax free and so yes it is sort of a Tax Free income. However, Dividend arising out of a Debt Fund is subject to DDT (Dividend Distribution Tax), which is borne by the fund house before handing it over to you. This amount is 25%. So the Fund house pays a dividend under a Debt Fund it has to deduct this 25% and then hand over the amount to you. Example: Fund ‘A’ declares a dividend of Rs 2 per unit. On this it will deduct 25% DDT which is Rs. 0.5, thus the effective return in your hand is Rs. 1.5 per unit. This however is Tax Free in your hands now. But the Tax was already deducted. This option works similar to the Dividend Payout option in terms of the reducing NAV and the DDT for Debt Funds, while the Equity Funds enjoy Tax Free dividend. However the difference here is that the dividend that is declared for the fund, gets re-invested in the same fund at the prevailing NAV. So for instance, you choose a fund ‘A’ with NAV 100 from the above example, the NAV after dividend is 80. The 20% dividend you receive will be re-invested on your behalf directly in that same scheme at the NAV of 80 instead of 100, since it reduces after the Dividend is declared. Thus your invested money is earning for you on its own under this scheme. However, the thing to note here is that the re-invested Dividend is treated as new investment and hence the lock-in periods will start from that re-invested date for those units that are purchased as part of reinvestment. Also you may attract entry load on your re-invested units if the fund has such a provision. This is a simple and straight forward option wherein you invest your money in a fund and let it grow. You do not get any returns till the time you withdraw from your fund either fully or partially. In this option, your NAV also increases and irrespective of dividend declared under the dividend option of the same fund, your NAV under the Growth Option is not affected as you have not chosen to use your appreciated money from the fund. The dividend and profits accumulate under this option. Growth option in simple words is something that keeps growing and compounding and until and unless you withdraw from it, you do not get to use the returns. 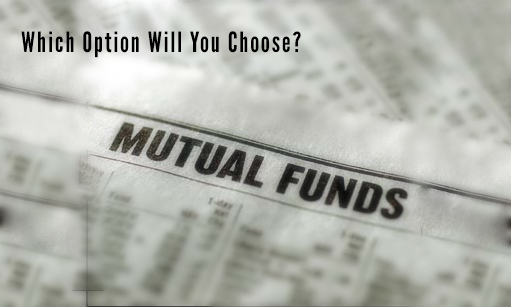 Growth option is likely to give better returns among all 3 options in Mutual Funds. Well, it all boils down to the fact of what you are investing for. If you are investing for some long term goal in mind, where you do not need any money in between, Growth option should be opted for. It also gives better returns compared to the other 2. Dividend option can be opted for if you need funds at regular intervals and would want to cash your profits when they are declared. Your NAV will go down, but then you are able to use the fund today itself. Dividend re-investment is something you can opt if you like to cash in on your profits then and there, but do not need the money for your own expenses or use, and instead would want to buy more Units under the same scheme. Thing to note here is that even if you would want some sort of regular income from your Mutual Fund investment, Growth Option can still be a good bet. If you can hold on to your investments for a year, then from the second year you can start withdrawing money from your Fund regularly through SWP or Systematic Withdrawal Plan. This way you get regular income at the same time your NAV does not go down as you are not using the dividend. This will also give you better returns and at the same time it assures you of the fixed amount of money since you are choosing to withdraw it and not depending on the Fund house to declare dividend depending upon the fund’s performance. 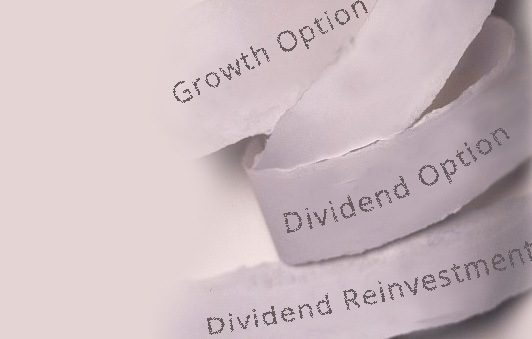 So what will you choose: Growth or Dividend or Dividend Reinvestment option? Feel free to leave comments on what you feel. Also you can get a complete guide to Mutual Funds if you have any doubts over here.